If you need to regularly charge your mobile devices while away from the grid, you may be interested in a new wireless charger which has been created by CorsPower, and takes the form of the CorsPower 7. The CorsPower 7 wireless charger is fitted with a powerful 10,000 mAh battery together with 256GB of internal storage for media and documents, as well as support for fast charging and integrated QI wireless charging. Watch the video below to learn more about the features and functionality of the CorsPower 7, pledges are now available via Kickstarter starting from just $38 for super earlybird backers, with shipping expected to take place during February 2017. The developers at CorsPower explain a little more about their portable wireless charging battery pack which is also equipped with a couple of useful USB ports for fast charging when required. Lithium polymer battery cells from LG offers superior safety through the improvement of the durabil-ity and heat resistance of batteries by applying nano ceramic coating and through reducing of short circuits inside the battery by using porous PO material with high ventilation. 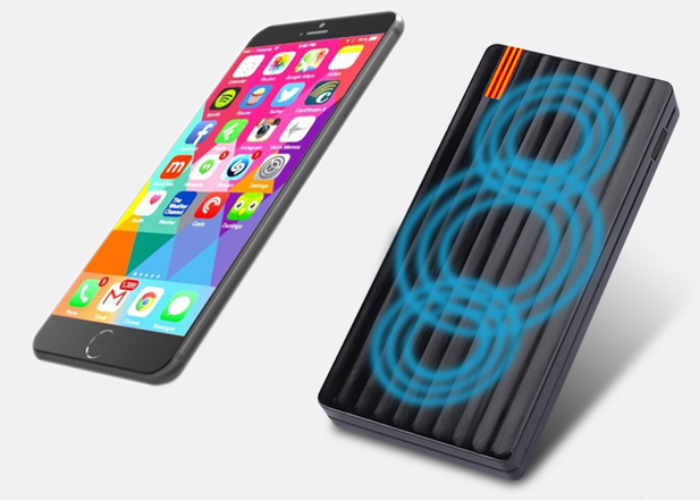 The lithium polymer 10000mAh battery is designed to provide users with a lighter, more powerful energy source that increases its portability and ensures that it continues working for you long after everyone else has gone home. Additionally, the CorsPower is designed to keep you safe and provide you with added protection. The battery is designed to retain more original capacity after 1000 charge cycle, ensuring a longer lifespan, the CorsPower is a device that is able to keep the battery functioning safely and reliably. This provides users with a long-lasting gadget that continuously powers their lives and businesses when they need it most. For more information on the new CorsPower 7 wireless battery pack jump over to the Kickstarter website for details by following the link below.